Today we have composed a latest post including all the preeminent and best directory WordPress themes present from all theme developers. 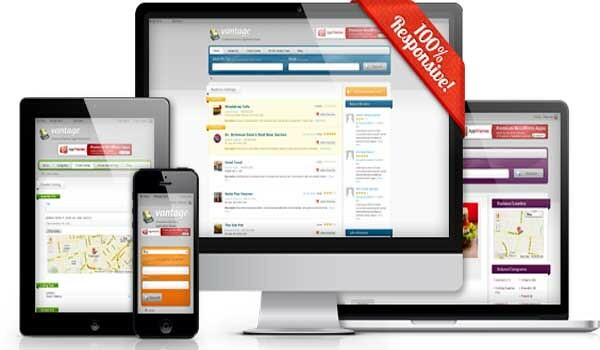 These kind of themes are specially designed to create directory websites similar to those of Yelp, Yellow Pages, Grotal or others where users can find a complete list of the things or services they are looking for. Since all these themes are WordPress based, it is extremely straightforward to create a new site instantly. All you have to do is upload the theme files to your new server, and your new directory website will be set up. Such sites allow you to invite users to upload their listings or you can do this on your own as well. You can use these themes to easily create a business directory, shop directory, classified ads websites and service listing sites. If you are also looking for a new hosting service, we recommend you to try this. Although there are many Directory WordPress Themes available in the market, but I have listed only those which are best, mostly purchased, widely used, offers lots of features, best in the design, and their theme developers cater exigent support. Directory is no doubt one of the best and most cutting-edge directory theme ever build and present today. The theme offers all the features you probably need in your directory site along with some supplementary that you might not require. Flatly, the developers have worked till the last inch to exhaust down the competition in their favor. Not only you can create a local directory, this theme allows you to create a global directory as well with all the 200+ countries already present in the database. All you have to do is enable the option. What more, you can dictate your terms to the users by charging them as much as you want to submit listing. Yes, it is extremely easy to create price packages and customize it when and where you want. Other than all useful feature, one feature that is extremely rare and is offered in this theme only is the – Custom post type management. This feature allows you to create as many custom post types as you want and populate it with content. Directory from Enginethemes.com lets you design your website design using different content modules. With the help of page builder and WordPress customizer, anyone with even zero coding skills can design the structure of the pages. Even the more straightforward is the ability of the theme that will allow your visitors to submit their business listings using ultra-optimized front-end submissions. A dedicated page for each listing is well designed and covers almost all options including address info, contact, website URL, images with lightbox support and a small map over the right sidebar. More interesting is continuously loading UX with which next listing loads just below the existing listing without even any page reloads (Awesome feature). Moving away from Templatic and its child theme, the next most popular is PremiumPress. Responsive, wide screen and an SEO friendly design make PremiumPress the second best on our list. Although the theme may not offer extra advanced features like Directory from Templatic, it does offer all the features required to setup your directory website. 30 Free Child Themes – The best thing about premium press is that it offers free child themes unlike Templatic that charges decent bugs. Yes, PremiumPress is currently offering 30 Free child themes if you buy directory theme from them. The theme also offers lots of money-making options as well that includes paid memberships and ad packages, listing enhancement offers, Adsense, email marketing and even price per category. So no doubt, this theme is also one of the best options to try. Another directory theme from Templatic, used by 100s of our WordPress clients – Geoplaces is again one of the best business WordPress directory themes for a local or global directory setup. Not only is it best, but it is the oldest among other themes too, which has been updated from time to time with features. If you are a theme developer, you will find extremely easy to customize this theme as compared to other themes on the list. With many exclusive features like multi-city options, splash homepage, widget based home page setup, mobile ready, event listings, inbuilt payment options, coupon system and much more; it is definitely a great choice. An admirable feature is the – Splash homepage feature that allows users to select city first before entering the site. The theme also supports WPML so creating a multilingual site won’t take any of your resource and time. The only drawback of this theme is its design and visuals. In every 10 customers using this theme, 8 of them had asked us to provide a visual enhancement along with some other design changes to suit their need. If you are of the view that a directory site should look delectable, then Listify has got you covered. It is packed with compatible features that fully focus on functionality and nice design that makes you site look pleasing. The template is very versatile and aligned with many payment gateways that means you can build any directory site. And yes, you do not have to worry about Google and search engines either for it comes with schema support. Listify is a complete package, and you certainly need to have a look at the demo. A popular directory WordPress theme, Javo is buzzing with modern features and a customizable body. It knows the ins and outs of directory site creation and thus, gives you great results in return for a fair price. 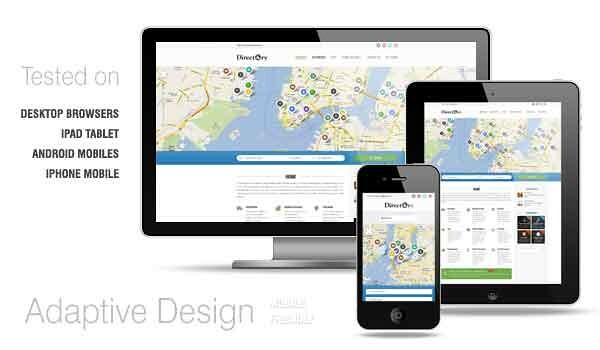 It is home to responsive layout, PayPal integration, AJAX powered Google map, custom fields, rating system and many more attributes. All are here to make things easier for the users so that they can submit smoothly. The audience will also have a good time searching your site and thus, you will not find it difficult to make your mark. An awesome directory theme, SpotFinder has been designed to the contemporary requirements in mind. It is very exclusive and keeps your audience engaged with the informative details and easy navigation. The template has got custom pages, 200 preloaded countries and almost 4000 states Directory and many more useful features. It will give you ideal results and you will be able to make money in various ways. The users will also find it very easy to submit their content and you can manage everything from the backend. A smooth and strong Directory theme, Salvatore is surrounded with modern and useful features that will give you an ultimate site in minutes. It has got Google map, custom contact form, quick search option, listing detail page, etc. using which you can set your online platform and serve the information seekers. The template is highly user-driven and gives you many options to engage the audience such as rating/review feature, events section, user favorites option and lots more. Salvatore is a superb choice in the current times and totally open to customization. You will love its performance as it will bring you quick customers and revenue. A friendly and feature-rich directory theme, Locations gives you all the requisite tools to build a brilliant site. It is loaded with Drag and Drop builder through which you can build pages instantly and get into the performance mode. Locations has got a very bright and visible search area that yields quick results and never keeps the visitor waiting. It is also customizable and accepts tweaks with open arms. You will love it and it will reciprocate with amazing returns on investment. Alright, in-case you were not impressed with the design of the above directory theme. Well, well, well! Here is a child theme offered by same theme providers. In simple words, this child theme offers all the features as offered by above directory theme along with some cool design enhancements and adjustments. Another brilliantly designed child theme from Templatic for the users not impressed with both the designs above. We are sure YellowPages would excite you just like it did us. This is so far most likely in design of original YellowPages. Once again, the theme has all the features as provided by Templatic Directory framework along with many visual enhancements. Geotheme is as good as Geoplaces. In fact, it is derived from the Geoplaces only. Although cloned from Geoplaces, still there are lots of different options between the two themes. A standard license comes offers 2 free child themes as well along with 6 months of free support and updates. An iOS app is also available with Geotheme, which you can use to create an iPhone app for your site based on this theme. Social login option available in this theme also allows you or your visitors to login with their social accounts with hassle free sign ups. Geolocation feature enables users to be redirected to their closest location automatically, or a new location could be triggered using search or browsing. A genuine critic, Geotheme completely lacks in the design and visual department but stands tall in the features. 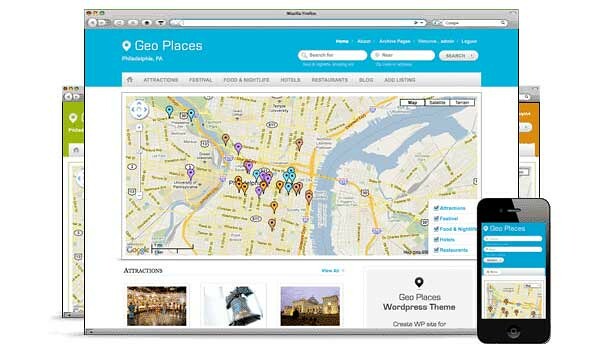 For more information on choosing the Geoplaces or Geotheme, you can read this review post. This theme is suitable for directory, as well as business sites for it, is WooCommerce compatible. Diamond delivers you exactly what you want and in return asks for only a fair price. It carries the cool parallax slider along with many other compatible features. You get an entirely widgetized homepage, directory module, responsive layout and lots of other useful features that will ease up your work. Last but not the least, you will have a very smooth ride personalizing it and will get free lifelong updates. 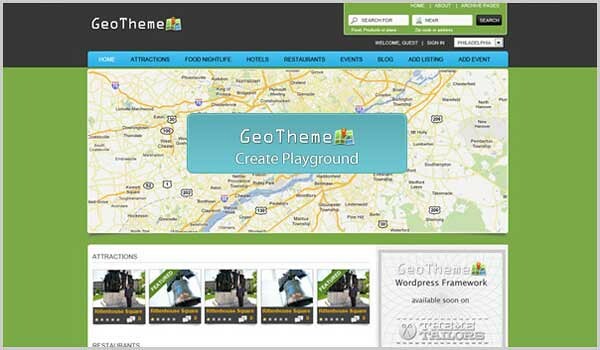 From the same authors as Geotheme, GeoDirectory is the latest in their portfolio. This is not exactly a theme, but a free directory plugin that can turn any ordinary WordPress site into a directory website. The framework can also be purchased to be used along with the plugin although not necessary. The framework is robust in the sense that it allows you to customize almost anything in the theme easily. This means you can create a directory site for absolutely free and then install any feature as you need them. Thus, you would be paying only for the characteristics that you want. If you want to use your theme with directory features, then this free plugin is surely a right choice. 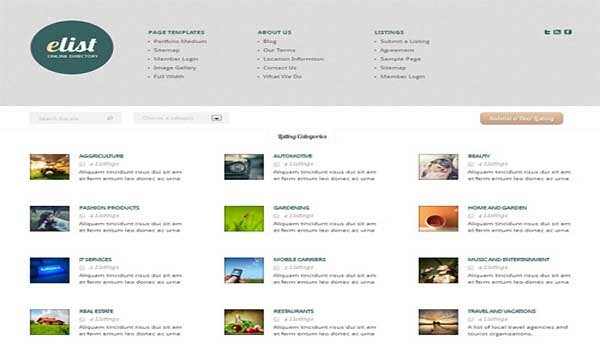 Vantage from Appthemes is again a very popular WordPress Directory theme. You can quickly create listing or events with this theme that can be used for any site, including real estate, travel agencies or any other business or service. The front-end submission form looks good along with claimable listings and monetization options feature. The only limitation of Vantage theme is that it only allows a single city option. That means you won’t be able to take your local site to a global level. The Directory Portal WordPress directory theme is among the newest directory theme on the market. In fact, it is the first of its kind to be listed on Themeforest. There are many new and exciting features, but if you are looking for multi-city options; you might get disappointed as theme doesn’t offer any multi-city options. Business Finder comes with integrated PayPal and recurring payment. The theme is built as an advanced version of Directory Portal, the theme listed above. The theme offers many advanced features like geolocation, rating system and sorting features. The theme also includes 5 different headers along with revolution slider, Google Maps & front end registrations. It is easy to start earning a recurring passive income using Geocraft. There is also an integrated user rating system where users can leave a review or rate the published listing as per their experience. Again, Geocraft lacks multi-city options and is good only for someone looking to create a local directory site. Sitemile creates advanced app themes and Buzzler is one of them that can be used to create directory or listing site. Theme comes loaded with many features like multi-language, multiple layouts, unlimited color options, social profile logins and integrated payment gateways. A value club, offering more than 80 themes for just a few bucks. The theme comes with lots of features including the shortcodes, eCommerce integration, custom page builder, unlimited color schemes and more. The theme also supports WPML that means you can easily use the theme in any language you want. Directory is a classified ad theme from Colorlabsproject. The theme allows to create an advertisement directory. The theme contains a submission form on the homepage that allows the visitors to fill and submit the listings easily. Well, we have tried to cover all the best possible WordPress Directory themes in the list above. If we have missed any of your favorite Directory WordPress themes; Please let us know via comments below. That’s a really comprehensive list of premium WordPress Directory themes you’ve put together. It’s a really great resource for anyone looking to set up a Directory site. I hadn’t realised there were so many! Hi Tim, I appreciate that you liked it. Depends on what features you are looking at. I will recommend you to go with geoplaces. It includes all features although some design changes would be required for better site graphics. I found your blog, really interesting in terms of providing information to relevent users. Hey I guess I missed this theme in the above list. Its really great looking theme. I loved this post and I’m on to read the article comparing the top two. I know NOTHING about web design but I have big dreams for my business. This information / resource is invaluable for those who are starting this kind of website. Thank you. Which of the two themes would you recommend, geoplaces or geotheme? I don’t want to end up buying the wrong theme. For example, am I able to modify SE, designs and layouts my way like moving around so it wont be exactly the same as the default theme? Hi Great job, I have spent three days scanning for the best directory site for a friend of mine. At the end I found your site! But one important thing is missing in your review, I think…… Is it Multilingual? Y/N? Great info, and a great list of themes/plugins. I’ve been looking at as many directory themes/plugins as I can find for comparisons. Quick question, though, is there a reason you didn’t mention DirectoryPress from PremiumPress? what exactly do you mean by multi-city and single city only? Just trying to figure out if I need it or not. Thank you for the reviews. 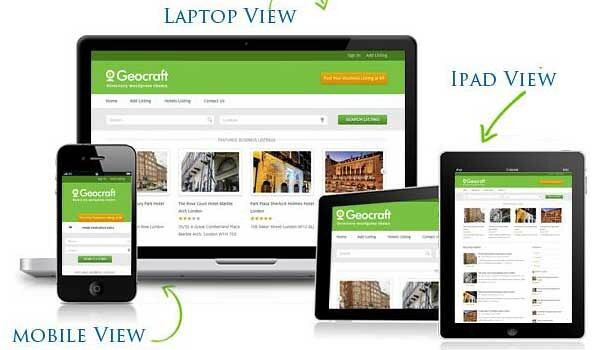 Do you know how Geotheme compares to Vantage or Sabai? Any idea if any of these include both a Geo location Map, and the ability for multiple locations? It seems that multiple locations is the missing link. Not sure why, because most businesses have multiple locations! But, these themes require businesses to upload the same information over and over in order to get all locations on the maps. Why not multiple locations options when they list their listing?? Marvellious themes. I came here searching for classified themes to use on a classified site and i found some really cool options. Thanks for that! Fantastic list of Directory Sites, Thank You! I have been running a WordPress Directory site for some time now, using the GeoPlaces Theme. When GeoPlaces first launched this theme was riddled with ‘bugs’. Frustrated users started looking at alternatives and at that stage, there were no other ‘decent’ directory themes. So, a frustrated developer went out and created GeoTheme. When GeoTheme launched it too, was full of bugs and reviews for both themes were poor. I stuck with GeoPlaces due to the fact that I wasn’t prepared to spend more money on another theme and quite honestly, GeoPlaces Version 4 is now a very robust and feature rich Directory Theme with Multi-City Support. Where GeoPlaces falls short (in my opinion), is in the way it handles e-mail notifications (this works, but it could be better). One Feature I find lacking in most Directory themes is Package Level Features Control. By that I mean that few themes offer the functionality to restrict or grant listing owners with more or less featured based on the ‘package’ they sign-up for. eg. Free Listings should offer restricted functionality, whilst Featured or Paid Members should get access to more functionality. BusinessFinder (listed above) is the only one I have found, to date, that offers this functionality! Aware some blog. I got helpful to get good business directly wordpress theme for my client. I find this list a heaven-sent, because I’m actually right now in the middle of deciding which theme to use for a directory site I’m building. I came across Geoplaces and all its variants and the Directory theme from Templatic. It was getting difficult to keep track though. So nice to have all of them nicely in one place, side by side. Its very nice blog.Word press directory and classified theme easily handle by the user. SpotFinder is coming back soon guys. None of these themes even come close to SpotFinder’s potential, so we’ll see how things shake up in the next few months.